Harry Forrester has not started a game for Rovers since August 19. 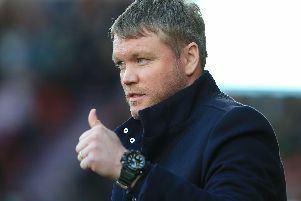 Doncaster Rovers are flying under new boss Darren Ferguson but here are five burning questions fans might be asking ahead of this weekend’s clash with Crewe. 1. Is this still a honeymoon period? Ferguson’s record to date makes excellent reading but to what extent do you put those results down to ‘new manager syndrome’? Is it simply a case of players raising their game to impress the new boss? The way this team has reacted to the defeats against Peterborough, Millwall and Rochdale suggests there’s more going on. The test now is to be consistently consistent. 2. Do Rovers have enough firepower to keep moving up the table? Nathan Tyson’s enforced exit at Cambridge highlighted Rovers’ current shortage of out-and-out attacking cover. Tyson and Andy Williams have combined superbly in recent weeks. A lengthy lay-off for either could potentially jeopardise Rovers’ form. 3. Will Conor Grant stay beyond January? There were eyebrows raised when Ferguson made a midfielder his first signing but keeping Grant beyond January 2 now looks imperative if Rovers wish to continue their recent progress. Might a Championship club come calling for him? 4. What’s going on with Harry Forrester? Has Forrester really fallen behind Billy Whitehouse and Jack McKay in the pecking order? Or is there a deal lined up to cash in on him in January? Since starting the first four games of the season, the 24-year-old has been on the pitch for just over two hours. 5. Will Rob Jones play for Rovers again? Jones is yet to feature for the first team following his interim manager duties and his lack of pace would appear to make him an unlikely choice to play either side of Andy Butler in a back three. Out of contract in the summer.